Photograph courtesy 20th Century Fox Film Corporation. It isn't very often that I mention a movie on this blog, but after seeing Life of Pi, I simply cannot help myself. Best art date ever! 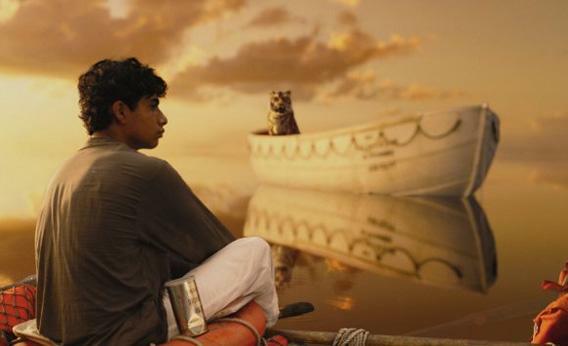 The Life of Pi is a story (the best story?) that involves faith, adventure, truth and beauty. The lush, rich imagry of this film is complimented by astounding technical accomplishment. It truly is a marvel for the eyes. Let yourself be taken away and this film will swallow you up and you'll forget that you're in a theatre - instead you'll be on the boat with Pi, fully absorbed in his world. Don't let the use of 3D deter you - this is truly the most superbly integrated use of the technology that I've ever seen. It does not detract from the experience. Instead, it enhances it. Watch the trailer above to get a taste, and try to read Yann Martel's novel before you see the movie! These are two hours that will stay with you long after.